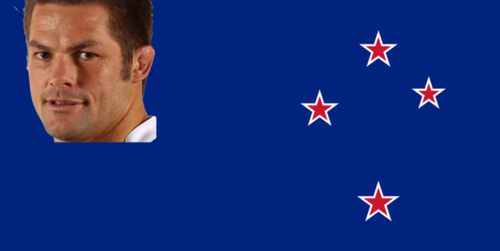 Would b beneath SBW 2 b waterboy! How bout ball boy?! Ref Owens comes back for the penalty. Another Aussie lineout in the corner. White tries a crossfield kick but Slade does enough to tip the ball out. But Owens was playing penalty advantage. So for the third time in a minute the Wallabies will try a lineout drive in the corner. Steven, the moment you said neither team was penetrating the ABs started their rampage. Four tries. So you're saying the All Blacks owe me one? Great defence from the All Blacks. No way through for Aus and now the All Blacks have the scrum feed. Analyse the score Del Boy!!!!! SBW is still a good player, just Nonu is better. Dont make him look too worthless. Steven your doing and awesome job???? It's actually not good for sthn hemisphere rugby that the Wabblies are so pathetic. Couldn't NZ give them some help to improve? Just over six minutes to go now. The All Blacks have broken down the left wing. Savea strides out and nearly over the Wallabies fullback, the ABs spread the ball wide right and Ben Smith tries a centering kick in behind. Aussie clear the loose ball. NZ lineout on halfway. Another scrum now to the All Blacks on halfway. The last five minutes have been dominated by scrums but the crowd don't care. They are loving this All Blacks thumping. And what a way to see of Richie. Remeber all of the articles over the last week about how the AB's look like theyre past their best, too predictable and so on and so forth? I think those writers have got a big plate of humble pie for supper tonight! Out of nowhere, Folau has run from halfway to score. Folau pinched an ABs crossfield kick and sprinted to the line untouched. A small blemish on a pretty comprehensive All Blacks performance. But Folau once again showing that he is the best in the world under the high ball. Bad kick. Hope they dont try this in a knockout game! Careless! Biggest margin between the teams was 37 (All Blacks) in 1996. Probably won't be beaten tonight but the ABs are the Come Back Kings right now! Damn I thought we may have had a chance at that biggest winning margin of 37 set back in 1996. Ah well still an amazing Response from the ABs!!! Into the last minute and the All Blacks have the ball 5m out. One more try? Fekitoa knocks the ball on and that should just about do it. Time is up on the clock. The Wallabies have possession deep in their half. The ball is out and it's all over. 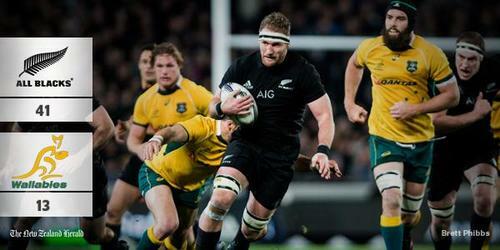 The All Blacks have retained the Bledisloe Cup. The kiwi landlady of a small rugby mad pub in Grosmont on the welsh english border can put the last week of public ridicule from the locals behind her and be proud again....thanks ABs. Thanks guys for joining me, it was a great night of rugger. We will be live blogging all the All Blacks matches at the rugby World Cup so make sure to look us up when the games are on. Excellent game boys. Like I said, final score is what matters. If it ain't broke, don't fix it aye? Well done AB's, but looking forward to Wales vs Australia, October 10. That'll be a game. Cheers Steven, good reading. Make sure you stick around tonight soon because very soon we will have match report, analysis, player ratings and video highlights online.